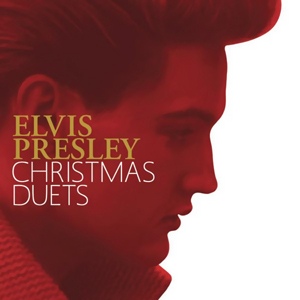 Elvis Presley - "Christmas Duets"
What happens when you pair one of Christmas and the music world's legends with contemporary Country stars? Well, you get a pretty damn good collection of yuletide hits in the form of this new album. When people think of classic Christmas artists the discussion invariably comes to Elvis. While his record label (RCA Records) has found numerous ways to repackage his material, the pairing of the King of Rock and Roll with Country music’s leading ladies is a novel and ideal way to celebrate the birth of baby Jesus. This collection starts off with “Blue Christmas” and Elvis’ vocal is matched up with Martina McBride’s. It’s a whole new single for the powerful vocal duo and while the song (and subsequent video) have no real reason to work as well as they do, the song just sparkles. Martina’s vocal is spot on and the new arrangements sound sophisticated. Carrie Underwood joins Elvis for the melancholic “I’ll Be Home For Christmas” and as our country’s military members are away at war, the song serves as a great spiritual reminder of what the season is about, beyond celebrating the birth of Christ. “Here Comes Santa Claus” is a happy yuletide pairing with LeAnn Rimes while “White Christmas” is a jazzy pairing with Miss Christmas herself, Amy Grant. Wynonna Judd’s vocal has often cited Elvis as one of her vocal inspirations and after listening to her sing with Elvis here it’s easy to see why on “Santa Claus Is Back In Town” a smoldering bluesy number that is only rivaled by Gretchen Wilson and Elvis’ duet on “Merry Christmas Baby.” Sara Evans' reading of "Silent Night" mixes well with Elvis as well while the three re-mixed solo Christmas tracks ("The First Noel," "It I Get Home On Christmas Day" and "Winter Wonderland") also stand out and prove why Elvis is an all-time favorite. “Christmas Duets” is a timeless Christmas album that helps set a good mood while doing things this Christmas season. For anyone who is a fan of both Elvis Presley and country music, this may just be the perfect yuletide album.